The municipal government of Kalamansig in Sultan Kudarat invites photography enthusiasts from all over the region and neighboring places to visit the town, celebrate and experience the 1st Salagaan Festival from July 26-30, 2017. 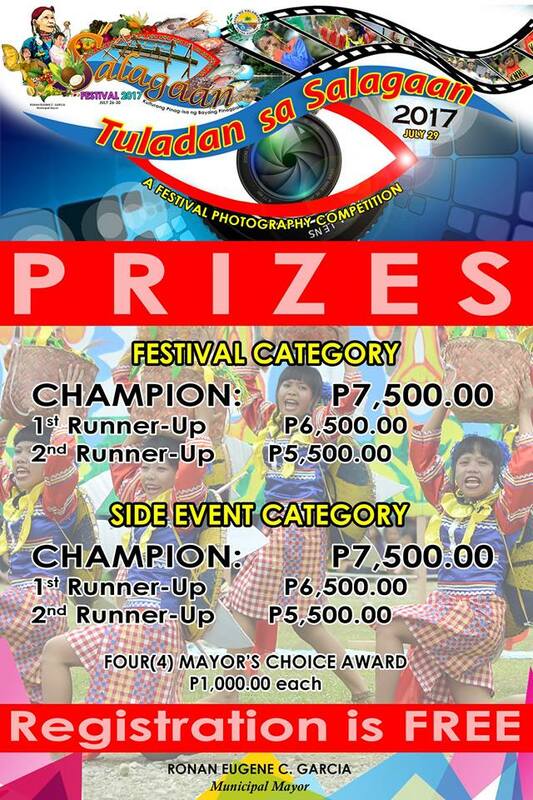 The LGU is holding a photography competition as part of the celebration. Capture the fun and excitement of different activities of Salagaan Festival and win exciting prizes. Check out the guidelines and mechanics below. Open to all but MUST be a registered participant. Orientation will be on July 25, 5o’clock in the afternoon at the Mayor’s Conference room. Participant must submit a 2x2 picture for festival ID that will be released after the General Orientation. Participants must be an amateur or professional photographer. A professional photographer is considered as such if he/she has been winning photo contests. Photographers retain full copyright for all pictures submitted, however they will authorize the Municipal Tourism Office the use of said images for its promotional campaign WITHOUT compensation or remuneration provided, the photographers will be properly acknowledged and credited for the use of image. Participants are required to submit minimum of five (5) and maximum of ten (10) entries per category. Three (3) photos from each participant will be selected by the judges for final judging. i. To showcase the Bountiful Harvest of Kalamansig. ii. To revive the culture and traditions of the Dulangan Manobos. - Watermarks or any identification marks are not allowed. All adjustments must be done thru camera. Images that are perceived as offensive, sexually explicit, unlawful, and discriminatory are considered disqualified. The event committee shall retrieve each copy to be used for judging. Submission of entries for Side Events Category will open on July 30, 2017 at 5 o’clock in the morning and will close at 12 noon. Deadline of submission of entries for Festival Category will be on July 30, an hour after the Festival Showdown Competition. Late submission of entries will not be accepted. It shall be the entrant’s responsibility to make sure that his/her entry has been received by the organizing committee. For every category each participant is entitled with one (1) Major Award and one (1) minor Award ONLY. Winners shall be judged based on the criteria for this competition. The Champion, 1st Runner Up, and 2nd Runner Up will be awarded based on the ranked average scores. The decision of judges is final and irrevocable.